A man should never take footwear for granted when he travels. But he has to choose wisely; for one, there are limitations on how many shoes he can bring with him, as well as determining the right shoes for every occasion. Furthermore, not all shoes are great for travel, which is why we want to focus on the best travel shoes for men – including the Scarpa Men’s Margarita shoe , our top pick among many great options. 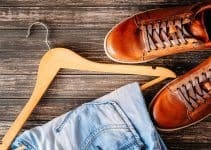 We’ll discuss what to look for when buying shoes for travel, as well as some general tips that will help make your trip more comfortable and less stressful. Let’s start with some buying tips. The right pair of footwear will enhance your travel experience and help make it a pleasure. The wrong pair? Well, an easy way to spoil your trip is walking around with a pair of foot-killing kicks. That’s why it’s important to choose the right shoes for travel wisely, and the following suggestions should help. The travel shoes you choose should pair well with your destination. That’s pretty obvious for certain trips, i.e., you wouldn’t bring a pair of hiking boots with you if you’ll spend most of your time strolling through a city. Or a pair of sandals for a winter trip to a cold climate. Not only should you consider your destination, but also the types of activities planned. You may divide your time between city sightseeing and spending it in nature, or perhaps your trip is business-related and you need to choose your footwear accordingly. Try on shoes in the late afternoon or early evening if possible. Feet naturally swell during the day and a new shoe that has a snug fit when you try it on in the morning may be too tight later in the day. Wear, or bring with you, the type of sock that you’ll wear with your new shoes when you travel. Have your feet sized by a professional whenever possible. You may be surprised to find out that your feet have slightly different sizes – which isn’t uncommon at all. Take them for a test drive. Once you’ve settled on the right size, spend several minutes walking around the store to get a true sense of how they fit. Is the toe box too tight? Does the heel slip? Too narrow? Too wide? Read the reviews of others when buying shoes online. Size varies from manufacturer to manufacturer; a size 9 in one brand may be a half-size different for another. When in doubt, choose a shoe that’s snug everywhere but not too tight, and provides enough room to wiggle your toes. 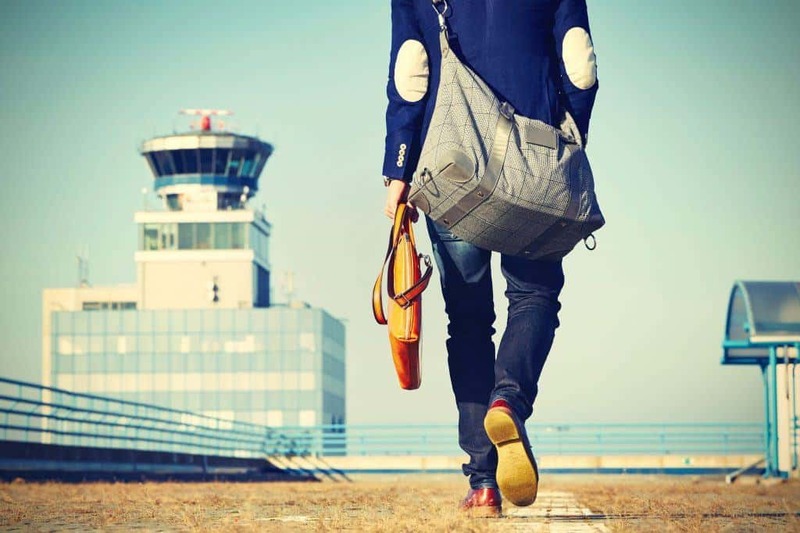 Consider all the variables when choosing a men’s shoe for travel. For instance, determine whether the shoe’s sole is appropriate enough – and durable enough – for your activities. Or, maybe it’s essential that the shoe is waterproof. Read reviews to gain a sense of a particular shoe’s overall comfort rating. It never hurts to look for a shoe that serves multiple functions, either. Some shoes provide enough support to handle a bit of hiking in nature, but still look fashionable enough to wear for casual occasions in the evening, such as a night out at a favorite pub. A quality shoe won’t weigh you down when you travel (or incur excess baggage fees) but must be durable enough to handle whatever activities you have in store. Let’s face it, how a shoe looks is important, too. While you shouldn’t sacrifice fit and comfort for appearance, you still want to look good, and not necessarily like an obvious “tourist” because of your footwear. 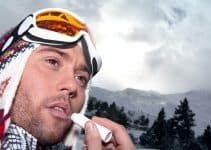 Besides, there are other reasons why you don’t want to look like an obvious tourist, including that you may be an easy target for scammers and would-be thieves. How well a shoe “breathes” – its ventilation and ability to keep your foot cool, dry, and cozy – is another important consideration. Some shoes incorporate microfibers that wick sweat away from your feet. Mesh uppers usually earn high marks for breathability. Leather, suede, and canvas are the most common materials used in shoe construction. Leather has plenty of visual appeal, is durable, and generally porous enough to offer some breathability. Suede is a staple of men’s casual footwear, while canvas shoes (such as sneakers) are popular in spring and summer, although certainly not limited to those seasons. Don’t be afraid to spend a little extra for a shoe that fits and looks good. But a high price doesn’t always indicate a shoe’s overall quality, either. Determine how much you want to spend before you buy and whether you’re willing to go beyond your budget if you find a shoe that offers everything you need. Next, here’s a look at our choices of the best travel shoes for men. We like versatility in shoes, especially considering the futility of packing several shoes for a trip. 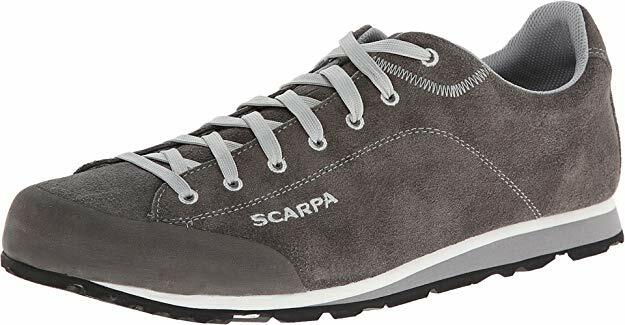 Scarpa’s Men’s Margaritas are at least a couple of shoes in one; they’re good for hitting the trails and strolling along the often unpredictable terrain of nature, while working just as well for traveling city streets. with a distinctive look that won’t instantly peg you as “typical tourist.” Indeed, they offer a win-win regarding shoes you can, and should, bring along on your journey. The Scarpa Margarita has a lot of features we like which make it a strong selection for our list of the best travel shoes for men. The upper consists of high-grade suede that’s stylish and durable, and also has a polyester lining that dries quickly and helps keep your foot dry in warmer climates. The Margarita also features an EVA midsole that cradles your foot firmly but not too snugly. EVA, or Ethylene-Vinyl Acetate, is an acronym you’ll often see in shoe reviews, and it provides cushioning and spring, it stays flexible in the cold, and doesn’t absorb water. It’s technically a foam and not rubber, but it offers excellent comfort no matter how you describe it. Another one of the Margarita’s worthy features is its Vibram Globe Grip sole. Manufactured by a company in the U.S., Vibram soles are the traction-of-choice for a variety of outdoor shoes found around the world. And there’s no reason that a slippery sidewalk should bring you down, literally. Then again, the Italian company Scarpa is known for innovation in designing performance footwear for all types of outdoor pursuits. The Margarita shares many of its features with the brand’s various hiking, walking, and climbing shoes, but is one that’s ideal for city adventures, too. It’s one of the most comfortable men’s walking shoes for travel. You’ll find the Scarpa brand in a variety of shoe reviews, and the Margarita ranks among their best. It’s an ideal shoe for travel no matter what type of activities you’ll pursue. If you’re a business traveler your shoe needs are a bit different than someone who’s traveling for pleasure. You’ll probably spend a lot of time in meetings, seminars, conferences, and face-to-face meetings with important bigwigs. That said, you need a shoe that fits the occasion, at least the “business” part of the occasion. The Allen Edmonds Men’s Strandmok Oxford Shoe has you covered with its classic style and design. It easily ranks among the best shoes for business travel. Made from 100% leather, the Strandmok has a timeless style that borrows from the Allen Edmonds’ vintage Strand design. It comes with new twists, however, including burnished nubuck – which is cowhide leather that’s brushed to give it the feeling of suede – and contains a plethora of natural oils that form an eye-pleasing patina the longer you wear the shoe. The cap-toe oxford design features a decorative brogue and contrast stitching. It’s an excellent look that works for dressier and semi-casual occasions, and is very versatile for travel. The Strandmok also feature a Dainite rubber outsole with a split reverse welt for extra stability. The insole consists of Poron, a urethane cushioning material often favored by people with painful foot issues. The heel measures approximately 1-inch. It helps make the Strandmok one of the most comfortable and stylish men’s travel shoes. 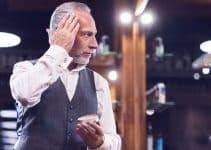 Allen Edmonds has a long line of quality dress shoes and it’s a list that makes it hard to single out one particular pair. But the Strandmok offers excellent versatility for travel, and features a wider profile that makes them a great alternative to boots when temperatures start to drop. The Strandmok has a fresh look that maintains the best parts of its traditional lineage. It’s great for travel because it’s appropriate for a variety of occasions. Who doesn’t like to kick back on vacation, or anytime they travel? Sandals are perhaps the ultimate in laid-back footwear and, depending on where you travel, always a welcome addition to your carry-on or suitcase. There’s no shortage of quality sandals to choose from and anything from Teva warrants a closer look. 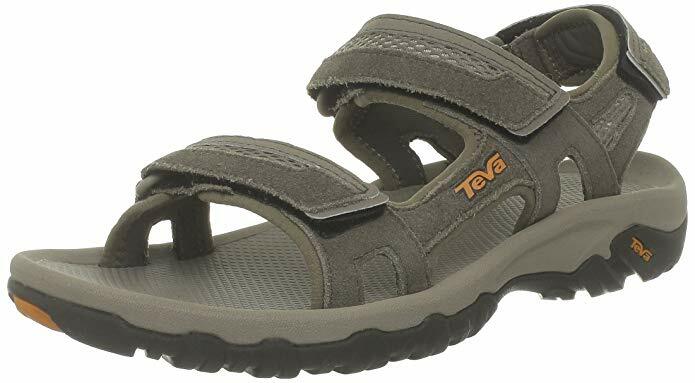 We especially like the Teva Men’s Hudson Sandal, although you can’t go wrong with the Teva Men’s Original Universal Premium Sandal either. Teva sandals, such as the Hudson, are ideal for kicking around the house or hanging out at a barbecue, but they’re solid enough for long treks, including when you travel and have lots of sightseeing on the docket. The Teva Hudson Sandal consist of a blend of leather and textile material that offers plenty of comfort. It also has excellent arch support; some reviewers who suffer from plantar fasciitis say they can wear these sandals for hours without experiencing discomfort. The rubber sole offers superior traction on a variety of surfaces, while you don’t have to worry about them slipping off unintentionally because they feature double straps – one that goes over the top of the foot and another that goes over your toes. Both straps include Velcro to make them easy to tighten and loosen. The Hudson also features an EVA footbed, which is another reason it offers great arch support. You’ll love the Hudson’s, and the Teva brand’s, versatility. If you’re like a lot of people, you have a wide range of activities planned for your out of town excursion: from hiking to rafting to making sure you take in as much of the town or region as possible. None of the Hudson’s attributes are susprising, mind you, considering Teva’s stellar reputation for manufacturing functional, comfortable sandals that also look good. The company was founded in the early 1980s by a Colorado River guide who wanted a “sport” sandal that held up to the rigors of many different activities. Teva remains committed to developing the latest in outdoor performance footwear. The Hudson is an ideal choice for travelers and for anyone who needs firm arch support. Teva’s sandals are versatile enough for a variety of activities and comfortable enough to wear all day. Barefoot, or “minimalist” shoes are the choice of many men, including those who ascribe to the school of thought that regular shoes cause all sorts of leg, ankle, and foot problems despite their manufacturers’ best intentions. “Barefoot is best,” say minimalist advocates, and if you have to wear shoes (which, well, almost all of us do), then at least wear barefoot shoes. Not that going barefoot in a favorite pair of shoes will go over well at your next business meeting, but if you can get away with it, why not? 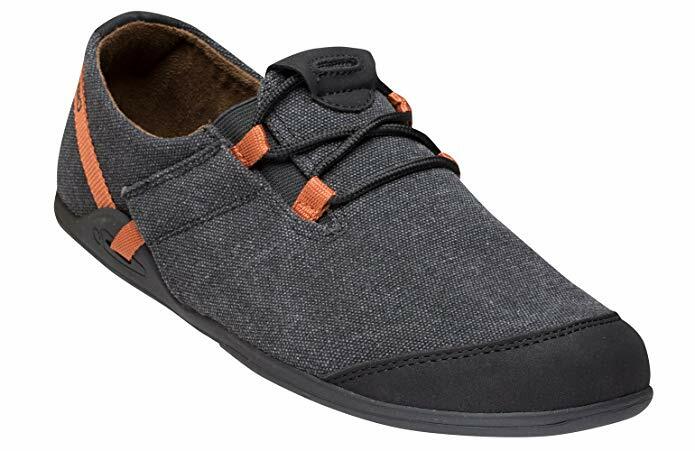 A more casual environment, like when you travel, is another reason to go sans socks, and a shoe such as Vivobarefoot’s Men’s Ra II Classic Oxford is a classy option. Vivobarefoot has a nice line of minimalist shoes and the Classic Oxford earns high marks across the board. It has a smart lace-up design that helps make it an appropriate shoe for more formal occasions. 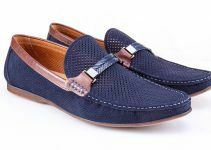 They’re ideal for the business traveler who needs a nice-looking, multi-functional shoe during working hours, but something that’s casual enough for evening activities. The Vivobarefoot Ra represents the second generation of the brand’s minimalist work shoe. It has a new, synthetic, outsole and a wider toe box – a toe box that at least one reviewer said is wider than any other shoe he’s tried. You won’t experience any pressure on your toes with the latest version of the Ra. The Ra’s leather upper comes in brown and black and has a traditional oxford look. There’s some debate as to whether these shoes are a bit too casual for a suit, but there’s no question of their appropriateness for business casual settings. Additionally, the shoe’s sole is ultra-thin, which makes it extremely lightweight and flexible. You shouldn’t wear the Ra on rough terrain, but it does provide plenty of urban comfort. The sole also has a puncture-resistant layer that makes it even more protective than a standard sole found on many other shoes. The Ra’s insole is thin and made of leather, while the shoe also comes with a removable footbed that makes it easier to get a custom fit. The heel is a bit flatter than on the original Ra design. Something else that we like about this shoe is its flexibility. There’s little, if any, resistance to the movement of the foot, and that’s not surprising from a company dedicated to making shoes that fit a person’s natural gait. Vivobarefoot is a top player in the minimalist shoe world and with good reason. Their Ra II improves upon an already excellent shoe, and it good for many occasions as you travel. It’s hard to beat the Sperry Top-Sider when it comes to casual wear, and has been for the last 80 years or so. And if you plan to spend any time enjoying casual activities – including during a business-oriented trip – then pack a pair of Top-Siders. You won’t be disappointed. The original boat shoe, Sperry’s Authentic 2-Eye shoes still has many of the same features that made it an instant hit in 1935. As its name suggests, it was marketed originally for men who spent a lot of time on boats and who needed a shoe that wouldn’t slip and slide on a wet deck. Today, many, many men wear Top-Siders for all kinds of activities, including as casual wear that’s ideal for travel. That’s no surprise considering their comfort and versatility. They pair well with a lot of casual clothes, including jeans and shorts, and look great for casual evening encounters even if you’re not on the road again. The shoe has a razor-cut wave-siping sole that’s good for wet and dry traction. They feature a 360-degree lacing system that helps provide a snug, but not tight, fit. It has an Ortholite insole that helps keep your feet comfortable. They have a shock-absorbing EVA heel cup for added comfort and stability. It also has a beveled outer heel. They look good in casual and business casual settings and look great when paired with polo shirts, khakis, and chinos. They’re made of genuine leather and hand-sewn for durability. It’s hard to go wrong with a shoe that continues to stand the test of time. You’ll like it because, among other reasons, its versatility, which makes it an excellent shoe to take with you when you travel. If exploring the great outdoors is a main reason you travel, then you need a shoe that holds up to the rigors of often unpredictable terrain. But you may also want something with versatility – such as one you can wear on the trail but also for strolling around in a more urban environment. If so, you should check out Merrell’s Burnt Rock Travel Suede Hiking shoe, which the folks at Merrell describe as “credible in the city, incredible in the woods.” The Burnt Rock features durable construction, which is nothing new by Merrell standards, as well as an attractive design that makes it a good choice for many casual occasions as you travel. The Burn Rock consists of 100% imported suede leather, an M Select GRIP outsole that provides durable traction and grip when you need it, as well as a Kinetic Fit Base with a removable contoured insole for flexible support. You needn’t worry about arch support with this shoe, either; in fact, one Amazon reviewer said the arch offered too much support. To each his own, but we think it’s a shoe that earns high overall comfort ratings. The upper also has a breathable mesh that helps keep your foot cool during all of your travels. Another reason we included the Merrell Burnt Rock on our list is that it requires minimal break-in time. It’s always a plus when you can go from box to pavement, or trail, without the often-frequent stiffness. The Merrell Burnt Rock Travel Suede Hiking Shoe combines durability, comfort, and style in a shoe that’s suitable for a variety of terrains and occasions. The Altra Vali Sneaker’s appearance stands out among the rest, which is why we think it’s among the most stylish walking shoes for travel. It’s also good for other activities, not just for strolling around while enjoying the sights and sounds of your travel destination. It features a sleek, knit upper and cushioned midsole that offers the kind of comfort that makes it ideal for everyday wear. The upper includes an engineered knit mesh that’s both breathable and stylish. The Vali Sneaker’s BLOOM insole foam (a new addition to its construction last year) contribute to its overall comfort. Additionally, the insole is made from algae biomass that helps lessen the shoe’s carbon footprint. It has a roomy toe box that makes it easier to walk in your natural stride. You won’t notice any pinching around your toes. You’ll appreciate the cushiony feel of the Vali Sneaker’s EVA midsole. It helps make this shoe ideal for spending a long day on your feet. The full rubber outsole provides plenty of traction on various types of terrain. But back to the Vali sneaker’s versatility. While it’s suitable for everyday use, including in business casual settings, it even serves as a decent workout shoe. It’s hard to go wrong with this shoe if you plan to do a lot of walking when you travel. The Alti Vali Sneaker serves a variety of functions and is appropriate for many types of occasions. They’re comfortable enough for all-day wear, which is saying something. To some, a vacation spent sightseeing in a popular tourist destination ranks low on their to-do list. For many folks, the world and its abundance of natural wonders make traveling while exploring the great outdoors the only way to go. If you fall into the latter group, you need a shoe that can handle the terrain, so to speak, and we think the Lowa Men’s Renegade GTX Mid Hiking Boot is among the best shoes for adventure travel. The GTX is a hiking shoe that’s functional whether you’ve planned a day hike or a weekend backpacking. While they qualify as a hiking “boot,” the Renegade GTX is attractive enough that you could wear them out on the town in the evening, as long as you pair them with the right kind of jeans (not skinny jeans, because they’ll look too clunky). The GTX also has plenty of great features to warrant a spot on our list, including its nubuck leather and fabric upper that’s durable enough for a wide array of outdoor adventures. It has a traditional lace-up system that helps provide a secure fit, while its Monowrap frame is lightweight and reduces the boot’s overall weight, while also offering excellent lateral stability. What else? You’ll also like the GTX’s waterproof, seamless Gore-Tex lining, and a comfortable midsole that provides excellent shock absorption and support. There’s also a climate-controlled footbed that’s breathable and will keep your foot cool even during long hikes in warmer weather. We talked earlier about Vibram outsoles, including about how effective they are for outdoor shoes, and the Renegade GTX features a Vibram Eco Trac sole for superior traction. Experienced hikers who’ve spent time on all types of terrain, say the Renegade GTX is comfortable and durable enough to hold up to the rigors of consistent, strenuous use. Few things are more aggravating than developing a blister on a long hike, but the GTX helps to protect your feet so that you can keep on trekking without impediment. The Lowa Men’s Renegade GTX is a great shoe for outdoor adventurists. It’s comfortable, stable, and able to handle long hours spent on the trail. If your answer is something like, “They feel good for the first time all day!” then you’ve probably sacrificed comfort somewhere along the line. Xero thinks your shoes should be so comfortable that you don’t realize that you have them on, and that your feet feel the same whether you’re wearing shoes or not. The Xero Hana Canvas Shoe doesn’t sacrifice comfort while offering a natural foot-first design (like typical barefoot shoes). They’re lightweight, flexible, and have a wide toe box that lets you spread your toes and relax. The Hana’s zero-drop, non-elevated sole is said to help wearers maintain proper posture, while the vegan-friend canvas molds to your foot. It’s a natural fit that provides stability and balance. Moreover, you can wash the shoes with soap and water, another plus when you’re traveling. While Xero also is known for its excellent sandals, their Hana Canvas Shoe proves that they know how to make all types of comfortable footwear. The Xero Hana is another good minimalist option for travel. They’re incredibly lightweight and hold up well even if you spend long hours on your feet. While there’s no one way to travel that fits everyone’s needs – variables such as destination, the reason for the trip, and personal preference come into play, after all – there are things you can do to make your life easier no matter where you’re headed, or the reason why. The following travel hacks will help relieve some of the stress of travel planning while also helping you to pack efficiently. What shoes you bring with you when you travel is very much dependent on your destination. It’s not hard to see why; after all, you may not need your hiking boots on a business trip (unless you’ll have a lot of extra time on your hands). Efficient packing means, in part, packing only what you need and the same rule applies for packing your shoes. In some cases, you may only need one pair of business shoes and one pair of casual shoes. If you’re traveling for pleasure, however, bring what you need – sandals, sneakers, a casual pair for evenings on the town, etc. – but don’t overdo it. Shoes can take up a decent amount of space in your carry-on or suitcase, so plan accordingly. It’s helpful to make a list of all of the activities planned for your trip. If you plan on working out in the hotel or resort gym every day, then by all means pack training shoes. If you’ve had the same plan on previous trips, but never got close to the gym other than walking past it on your way to the beach or favorite nightclub, then think twice about adding bulk to your suitcase with shoes you won’t use. The bottom line is this: Most people only need two pairs of shoes when they travel, three at most. More doesn’t always mean better. There are a few schools of thought regarding the best way to pack your shoes. The most common suggests that you place your shoes at the bottom of your suitcase or carry-on. If nothing else, doing so protects your clothes from dirt on the bottom of your shoes. You can also pack your bags in a large resealable bag which makes them easier to access once you arrive at your destination. Or, if your shoes are too big to fit in a bag, you can always bind two pairs together with a rubber band or twist tie. The Travel Security Administration recommends that travelers pack their shoes at the top of their suitcase or any checked bag so that they can easily access them if further inspection is needed. If you pack your shoes in an unchecked bag, it’s best to lay them on their sides whenever possible. Lay one shoe down in your luggage and then place the other so that the heel is at the top of the first shoe. Another way to save space in your luggage is to wear your bulkiest shoes on the plane (or train). Also, if you buy new shoes specifically for a trip, do yourself a favor and break them in first before you leave home. There’s no need to risk blisters on your first day of sightseeing. That said, you should also pack first aid for your feet, such as adhesive strips that prevent blisters, or medication that heals raw spots on your feet. Laying out your essentials the night before, especially if you have an early morning flight. Always keep your ID, such as your driver’s license and passport (if needed) in a place where you won’t forget them in the morning. Make sure that you have your wallet and the credit cards you’ll need for travel. Also, don’t leave home without a charger, or chargers, for your electronic devices. b) makes it easy to find items such as deodorant and when you need them. Among the primary reasons for choosing the shoes we did for your list was variety. Rather than exclude a certain type of footwear – such as sandals and hiking shoes and boots – we wanted to include a variety because the right shoes for you, and your destination, may not fit someone else’s needs. We also considered style, because there’s no reason to settle for a comfortable, travel-friendly shoe that stands out in a bad way, as well as other factions such as traction, versatility, and overall comfort. No matter how stylish they may look, they need to fit comfortably for long periods. How about you? What are your favorite shoes for travel? Why do you like them? We always welcome your feedback and suggestions.